Be the first to share your favorite memory, photo or story of Winnifred. This memorial page is dedicated for family, friends and future generations to celebrate the life of their loved one. Winnifred A. Diver, age 66 of Lac du Flambeau, WI died on Tuesday, February 5th at Howard Young Medical Center in Woodruff, WI. Visitation for Winnifred will be on Friday, February 8th at the Multi-Purpose Building in Lac du Flambeau, WI starting at 4:00 PM. Funeral Service will be on Saturday, February 9th at 11:00 AM at St. Anthony's Catholic Church with burial at Memorial Cemetery. 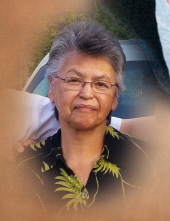 To send flowers or a remembrance gift to the family of Winnifred A. Diver, please visit our Tribute Store. "Email Address" would like to share the life celebration of Winnifred A. Diver. Click on the "link" to go to share a favorite memory or leave a condolence message for the family.